Rye Brook, New York, U.S.
Dorothy Edith Gilman (June 25, 1923 – February 2, 2012) was an American writer. She is best known for the Mrs. Pollifax series. Begun in a time when women in mystery meant Agatha Christie's Miss Marple and international espionage meant young government men like James Bond and the spies of John Le Carre and Graham Greene, Emily Pollifax, her heroine, became a spy in her 60s and is very likely the only spy in literature to belong simultaneously to the CIA and the local garden club. Dorothy Gilman was born in New Brunswick, New Jersey, to minister James Bruce and Essa (Starkweather) Gilman. She started writing when she was 9. At 11, she competed against 10- to 16-year-olds in a story contest and won first place. Planning to write and illustrate books for children, she attended Pennsylvania Academy of the Fine Arts 1940–1945. She married teacher Edgar A. Butters, Jr. September 15, 1945; they divorced in 1965. The couple had two children, Christopher and Jonathan. Gilman attended the University of Pennsylvania 1963–1964. She was Unitarian. Gilman worked as an art teacher and telephone operator before becoming an author. She wrote children’s stories for more than ten years under the name Dorothy Gilman Butters and then began writing adult novels about Mrs. Pollifax, a retired grandmother who becomes a CIA agent. The Mrs. Pollifax series made Gilman famous. Gilman's life is strongly reflected in her writing. She traveled extensively, and her travels became the settings for her Mrs. Pollifax books. In the 1970s, she moved to a property in a small town in Nova Scotia where she grew most of her own vegetables and herbs. This period was the focus of her memoir, A New Kind of Country. Her knowledge of medicinal herbs informed several of her stories, including A Nun in the Closet and Thale's Folly. Thale's Folly is one of her few books featuring a male protagonist; most of her books feature strong women having adventures around the world. In addition to Nova Scotia, Gilman spent much of her life in Connecticut, Maine, and New Mexico. 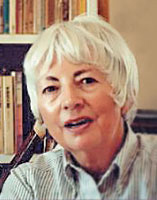 In 2010 Gilman was awarded the annual Grand Master Award by the Mystery Writers of America. In 2012, she died at age 88 of complications of Alzheimer's disease. She also contributed to Good Housekeeping, Jack and Jill, Redbook, Ladies' Home Journal, Cosmopolitan, The Writer, and other magazines. She began writing as Dorothy Gilman for her first Mrs. Pollifax book. The Unexpected Mrs. Pollifax (1966) was the first in what would be a 14-book series. The heroine, the eccentric Emily Pollifax, is a 60-ish, bored, garden-clubbing grandmother, and widow. Considering her life without real purpose, and after briefly contemplating suicide, she presents herself to the CIA, offering to serve as an agent. Initially recruited through a misunderstanding, she is excited, and a bit clueless about her role, but she quickly adapts to an unfortunate turn of events, and displays the common sense and grit that will guide her through future intrigues. The series, which ended in 2000 with Mrs. Pollifax Unveiled, consists of fast-paced escapades filled with danger and intrigue in Mexico, Turkey, Thailand, China, Morocco, Zambia, Sicily, and elsewhere. The character was adapted in the 1971 film Mrs. Pollifax-Spy. The Unexpected Mrs. Pollifax was filmed by United Artists in 1970 as Mrs. Pollifax-Spy starring Rosalind Russell. Angela Lansbury starred in the made-for-TV movie The Unexpected Mrs. Pollifax in 1999. ^ "Gilman, Dorothy 1923-". Retrieved 2 October 2014. ^ "2010 GM Ravens" (PDF). 9 December 2009. Archived from the original (PDF) on 10 October 2012. Retrieved 2 February 2013. ^ Gilman, Dorothy (1966). The Unexpected Mrs. Pollifax. Doubleday. This page was last edited on 8 June 2018, at 20:14 (UTC).